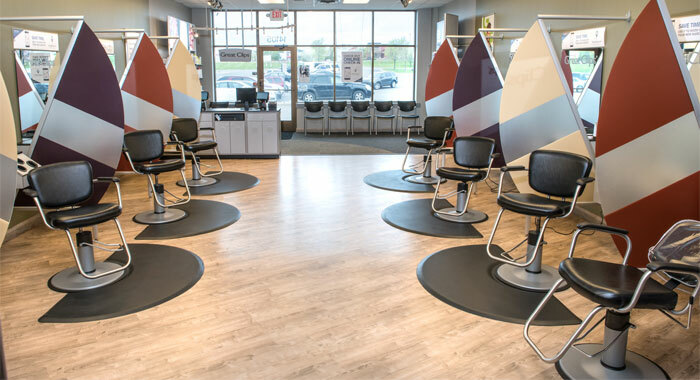 Great Clips is a completely franchised business with over 4,200 salons that cater to individuals looking for no-frills haircuts and hair styling services. This business has proven that success can be found in offering services that meet the needs of busy individuals who want basic salon services in a friendly environment. Great Clips prices start at about $15 for a standard adult haircut but actual price may vary by location. Great Clips has proven that they are force to be reckoned with in the hair care industry. Each of their salons across the United States is owned by a franchisee who operates under the Great Clips name. Therefore, walking into one salon will be similar to walking into any of them. Each one has a calm, friendly, low-key atmosphere. Customers love the friendly services offered to people of all ages here. Each salon is simple and accessible to people on any budget. Plus, Great Clips has shown that they can be innovative with technology as well. In 2011, they began offering Online Check-in, allowing people to check wait times at nearby salons and add their names to a wait list before heading to the salon of their choice. Additionally, Clip Notes, offered beginning in 2014, lets stylists add notes about customer preferences to a franchise-wide cloud base that can be accessed at any salon. Great Clips offers a variety of hair cuts and styling services and serves everyone from children to senior citizens. Children and senior citizens can enjoy discounted haircut prices. Clients can simply walk in and request any service because no services require appointment times. Haircuts and trims are among the most popular services requested. Individuals can also get low-priced trims for their bangs, beards or necks. Shampoo and styling can be added on to any haircut or can be chosen alone for a blow-out. Conditioning treatments are great for overly-styled, frizzy or very dry hair to make the hair smooth and soft again. Some salons also offer perms and wave treatments. Stylists provide quick but personalized services based on customer requests and on the history found in the franchise’s Clip Notes database. Each salon offers a variety of haircare products designed for all hair types and needs. From shampoo and conditioner to styling products and at-home deep conditioning treatments, Great Clips offers products to make one’s daily haircare experience super easy and to make styling simple for special events. Great Clips provides many top salon-only products from such popular brands as Joico, Tigi, Redken, Matrix, American Crew and Paul Mitchell. However, they also offer three of their own brands, which can only be found at Great Clips Salons. Solutions by Great Clips provides basic hair care that fits most everyday needs. Tea Tree Solutions uses natural products with pure oils and delightful fragrances for holistic haircare. Their GRIT brand is solely for men’s haircare and also includes extra products for body care. Since they first opened in 1982 and through their many expansions over the decades, this Minnesota-based company has shown that the average American values friendly service, easy operating hours and basic hair care. Originally, the salon opened as a college campus-friendly salon near the University of Minnesota. Quickly two other salons opened up nearby in the next three months. The first franchised salon opened in 1983 in the Minneapolis metro area, but the salons quickly grew throughout the United States. With well over 4,000 salons across the U.S., the Great Clips model has shown that no-frills business works well for the average American. Today, over 40,000 people are employed under the Great Clips name. The salons continue to grow, expand and employ more people as Americans continue to value budget-friendly self-care. In addition, Great Clips focuses on helping their neighbors through philanthropy. The Great Deeds program focuses on volunteer activities. The business also offers Clips of Kindness with free clipper cuts for cancer patients. Their annual Charity Golf Classic and their yearly support of the Children’s Miracle Network are also well-documented. Thanks. These prices are actually pretty accurate. thank you for the prices.